Strong political cooperation is the bedrock of BRI’s future success. Three headwinds − political discordance, trade uncertainty and technological disruption − stand in the way. As the proponent of win-win solutions, China should ensure BRI becomes a fulfilling regional enterprise for all parties. MUCH HAS been written about the myriad challenges facing China’s Belt and Road Initiative (BRI). Top of the list are financing, implementation difficulties and geopolitical complications. Most of these challenges can be resolved through strong political will on the part of all parties involved. Notwithstanding some initial positive response, such political cooperation is not so forthcoming. This could stand in the way of the full potential of the BRI. Take ASEAN as an example. Infrastructure financing has been the region’s bottleneck (except perhaps for Singapore or Malaysia). The BRI initiative emphasises infrastructure development – such as railway and highway construction, energy projects, ports and industrial estate development. This is clearly complementary with ASEAN’s needs. Logically, the BRI should be embraced by ASEAN, like the ASEAN-China Free Trade Area (ACFTA) initiative when it was first proposed. Yet seemingly, suspicion and hesitance is detected in ASEAN towards the BRI. China must take cognizance of this. Head Wind 1: Political DiscordanceThree headwinds could be impeding the BRI from realising its full potential – political discordance; trade uncertainty; and technological disruption. The advent of the BRI marks a clear change in Chinese foreign policy posture. Gone is the 韬光养晦 or “keeping a low profile” policy advocated by Deng Xiaoping. It is natural that regional countries are hesitant and require time to figure out how they should respond to the new more assertive Chinese geo-strategy. For one, BRI is different from ACFTA. Significantly, government budgets would be required for BRI projects, unlike ACFTA which merely reduces future revenue commensurate with the elimination or reduction of import tariffs. For ASEAN countries, government allocation of such budgetary funding is intertwined with domestic policies and encompasses an additional level of national financial complexity. China, however, has a more straightforward allocation of public funds decided by powerful echelons of Communist Party officials. This requires a re-examination of China’s approach and mode of engagement to enhance political cooperation with regional countries. Firstly, understanding the political and economic ground of host countries is paramount – this would involve establishing good feedback gathering networks which the Japanese government has done superbly in ASEAN through JETRO, JICA and Sogososhas (Japanese trading houses). Similar efforts by China will help it be more in touch with regional thinking and sensitivities. Secondly, China’s policymakers would need to display a skilful balance engaging both the ruling groups and the opposition in the host country. This balancing has also to be done in a sustained manner and on a long-term basis in order to achieve stability of relations between China and the host country. Handling these extra sensitivities may even demand Chinese officials to learn how to better understand the non-communist political system which they may not be used to. Thirdly, China would need to balance bilateral engagement and negotiation of resources with the individual host countries, with the overall strategic intent of building up ASEAN’s BRI infrastructure. Critically, China would need to avoid the Trump administration’s approach of pursuing bilateral “bullying” when stitching deals with other countries. One approach would be to integrate some aspects of the BRI with ASEAN initiatives such as the Master Plan on ASEAN Connectivity 2025. As with ACFTA, China could modify and apply new BRI engagement strategies honed in ASEAN as a pathfinder for working with other regions such as Sri Lanka, Pakistan and Kenya. This will help minimise the challenges of the BRI, particularly to facilitate the building of the third railway line between China and the West. Head Wind 2: Era of Trade UncertaintyExternal trade trends are also a strong influencer of BRI’s success, such as the ongoing “Trump trade wars”. Although China and United States are taking a negotiation hiatus, trade disruptions are expected to continue for some time to come. ASEAN and China are already closely linked economically with bilateral trade at an estimated US$480 billion in 2015, and a potential US$1 trillion by the end of 2020. 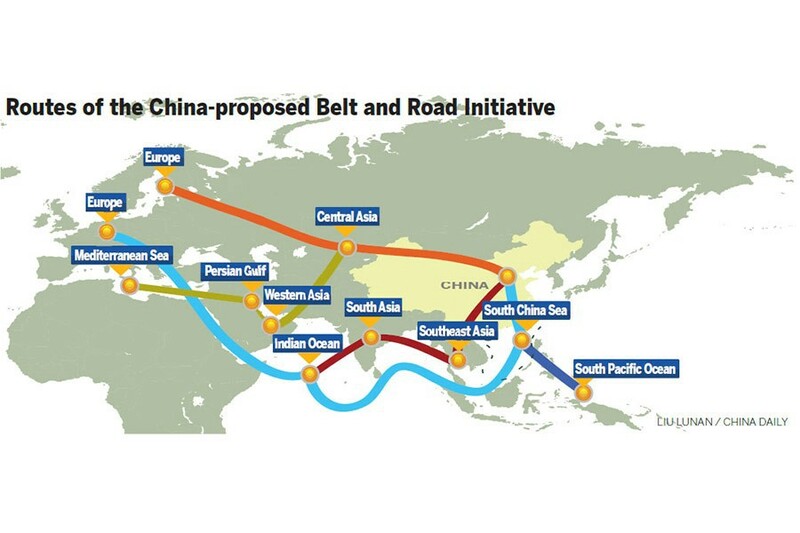 The implication of a successful BRI will be to draw the two regions towards closer economic cooperation. ASEAN’s hesitancy may be influenced by the uncertainty of benefits of the current political atmosphere. Reports show that various manufacturers in China are seriously considering moving production to Southeast Asia. Encouraging this trend would benefit ASEAN but it will also attract increased scrutiny and suspicion from the US customs authorities. In its trade war with China, the current US target list covers industrial tools, medical equipment and technological products, mostly defined under the “Made in China 2025” initiative. It is uncertain that Southeast Asian countries in their current stage of technical capability can replace China as the Tier 1 industrial suppliers for these products for global multi-national corporations or Chinese companies. China may wish to consider supporting supply chain networks that complement infrastructure development in the BRI initiative. For example, a win-win outcome under the current situation could be achieved with ASEAN (or other partner regions/countries) transiting into the processing hub for final destinations globally rather than for the China market. This phenomenon would be a natural progression for East Asian regional production networks in view of the increase in Southeast Asia’s trade deficit with China in intermediate goods (semi-finished goods, and parts and components) since 2013. Lastly, the introduction of 3D printing on a wide scale has the potential to create a new production system. This disruption could turn the global supply chain and existing production processes on its head, resulting in the dismissal of production lines, and drastic reduction of physical infrastructure, warehousing, transport including transborder shipments. The 3D industrial process will make distance a thing of the past. It is likely that ASEAN and Chinese policymakers have not considered this factor. But the uncertainty about the future success of 3D printing could be a factor leading to hesitancy of infrastructure investment. With the expansion 3-D printing in the manufacturing sector, production processes that require multiple manufacturing steps could be reduced and compressed: the designer will be at one end, while the printer or “manufacturer” will be at the other end, at the site of the customers or a nearby printer shop. In short, the global supply chain that we know today will be obsolete or greatly reduced and so are the infrastructures supporting these economic activities. The success of the BRI depends on the project’s ability to move away from a China-centric initiative to a regional joint cooperative programme, such as through ASEAN connectivity. Engaging ASEAN and winning over other countries’ political will is imperative. China’s creative role in overcoming the three headwinds is crucial. Otherwise, without the explicit partnership between China and the host country, BRI projects could evaporate in the face of new challenges and developments, be it disruptions from technology, domestic politics, and/or external geopolitics. Christopher H Lim is a Senior Fellow with the Office of the Executive Deputy Chairman at the S. Rajaratnam School of International Studies (RSIS), Nanyang Technological University (NTU), Singapore. Mok Sze Xin is an Associate Director at EY Asia-Pacific Tax Centre, Singapore. Sze Xin’s views are personal. Click HERE to view this commentary in your browser.